Welcome to Glebelands Farm! We are a mixed arable, beef, sheep and poultry farm in East Devon and have specialised in producing Christmas poultry for three generations. 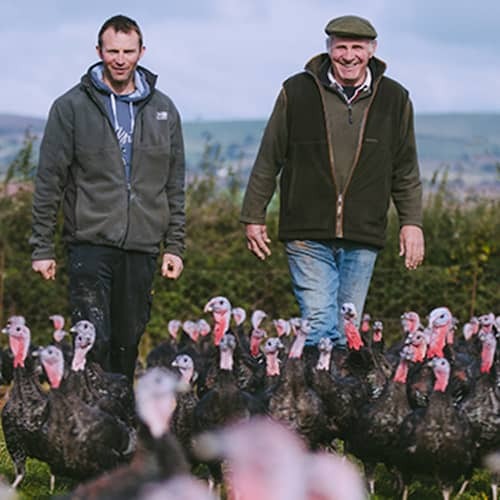 Our family run business has been rearing traditional farm fresh Christmas turkeys, geese and ducks at Glebelands Farm since the early 1940’s. We are proud to provide the general public, butchers and the catering trade with our farm fresh tasty birds. Our aim has always been to produce the highest quality poultry for your Christmas feast using a blend of traditional and modern techniques. Our free-range Geese and Turkeys graze on our luscious green pastures and our barn reared white turkeys enjoy spacious accommodation. Both are fed a mix of cereals, some of which are grown on our farm. Every Tasty Bird comes with a pop-up timer, cooking instructions and recipe book. Our poultry is delivered to you freshly prepared from Glebelands Farm by an overnight courier, in insulated chilled packaging to keep it tasty and fresh.